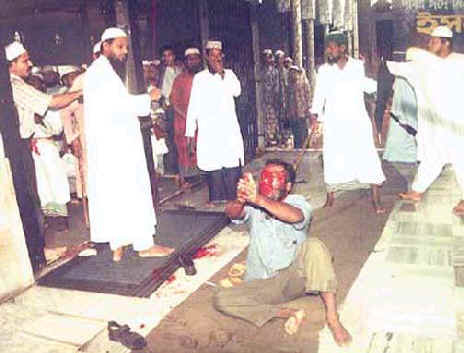 A Hindu being beaten by Muslims in a mosque in Bangladesh. He was captured outside the mosque while going home. After Friday prayers were over, the Muslims came out and grabbed the first Hindu they could. Mr. Vimal Patak a Bangladeshi born Hindu was beaten to death with sticks as the Muslim mullahs (priests) chanted "kill the Kafir!" (non-Muslim). With folded hands he begged for his life and died a brutal death. 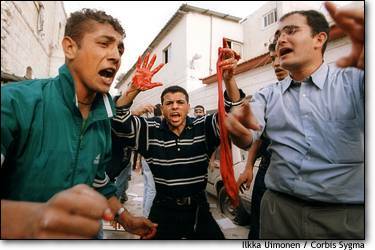 A Palestinian shows his bloody hands to the ecstatic fellow Muslims after butchering a Jew. Thanks for the post but I really wish you would put a warning or something in the title of your post that tells me that I'm about to see blood and gore. Not that I have a problem with pictures of blood and gore if you're exposing some violent injustice, it's just polite to give a warning dude. Anyway, I'm going to take you up on two things you said in the post, you highlighted both in red. Second, this level of barbarism is not exclusive to islam, or even to religion in general. There are genocides going on in many parts of the world all the time, and if what you seek is a horrific level of physical violence you only need to go to Africa, the hutus regularly slaughter and play with the organs of the tutsis. The confrontation between hutus and tutsis is said to be non-religious and more cultural, so for religious (not involving muslims) hatred and violence you'll have to look elsewhere on the continent or in the world, Ireland and India come to mind. And that's just looking at today. If you want to get into history (recent or ancient) then you can find violence driven by 99% of the religions that have ever existed. I think the author ( not me) meant "metaphorically"
Remember thy Lord inspired the angels (with the message): "I am with you: give firmness to the Believers: I will instil terror into the hearts of the Unbelievers: smite ye above their necks and smite all their finger-tips off them. قم بزيارة الصفحة الشخصية لـ مرحبيا ! جميع الأوقات بتوقيت امريكا. الساعة الآن » 12:21 AM.